Jaisalmer is a border district of India located in the state of Rajasthan and touching Pakistan. 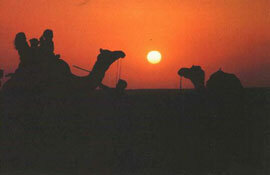 Most of the district is part of Thar Desert and offers excellent camel safari options. Jaisalmer is connected to other cities in the state as well as in Gujarat and some other places in India with National Highway No 15. At an altitude of 793 meters, maximum temperature is 46 degrees Celsius and minimum 35 degrees Celsius. In winter the highest is 14 and lowest is 1 degree Celsius. Best season to visit Jaisalmer is between October and March. Jaisalmer was founded by the Bhatti Rajput chieftain Rawal Jaisal in 1156. According to the local legends, seeking a more secure capital, the usurper was advised by a saint to build a castle on the Trikuta hill. It was in fulfillment of Lord Krishna's prophecy that a distant scion of his Yadav clan would build a kingdom here. There was water on the hill, a miracle performed by Krishna to quench the thirst of Arjuna. The hilltop offered the safest fort location, dominating and surveying the desert for miles. Jaisalmer fort is the second oldest in Rajasthan after Chittor and commands the desertscape from its 250 feet high perch on the hill. Three strong walls protect the citadel. Sharp turns on the road topped by high defense gateways made it invincible. At the highest point of the place can be seen an umbrella-Meghadamber symbolic of Krishna. The fort has five palaces called Sarvottam Vilas, Akhai Vilas, Gaj Mahal, Rang Mahal and Moti Mahal-all interconnected behind the seven-storied façade. Small stairs take you from one court to another with superb jail screens shading interiors from the fierce heat and desert wind. The Rang Mahal built by Mool Raj II has some exquisite murals painted on arches and spandrels. From the balconies you get a terrific view of the mammoth ramparts below guarding the small city. Balconies at the Gaj Mahal are also breathtakingly beautiful. The fort contains one third of the city's population within the small houses on the narrow lanes. Within the fort are the three most exquisitely sculptured Jain temples dedicated to Rishabhdevji, Sambhavanathji and the Ashthapadi temple. Their ornamentation done in the style of the Dilwara temples at Mt. Abu is simply marvelous. The emerald icon of Mahavira is an unparalleled gem. It is at an unhurried pace that the havelis (houses of rich merchants) should be seen and admired. 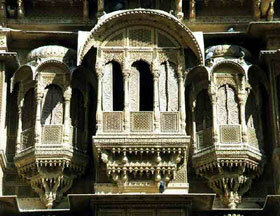 These havelis are the pride of Jaisalmer architecture, a part of the national heritage. Salem Singh haveli, at the eastern end of the city is an Arabian Nights structure, which like a wild flower blossoms at the top. Near the city center is the Patwon ki Haveli, built by Guman Chand Patwa and his five sons. The five suites built between 1800 and 1860 are virtually the showpiece of Jaisalmer's legendary architectural wealth. The carving on stone far surpasses in beauty the work on brocade and gold. The balconies are so delicately chiseled you would stand mesmerized by the splendor of it all, particularly when viewed early in the morning or in late afternoon. Oblique sunrays create enchanting and dramatic shadows, highlighting the carving and infusing a new life of its own. It is the grandest mansion in Jaisalmer, a veritable museum piece in the open. The third haveli belongs to Nathmal, a later day prime minister who gifted it to the Rawal and was allowed to retain it. Built by two brothers in 1885, this haveli has two identical looking portions, which are in fact two different parts united by a common façade. Look for the projected balconies which seem to emerge from books of poetry. So ethereal, so charming. The carving never looked better. A perfect example of jeweler's art applied to stone carving. The Muslim silavats (artisans) did a wonderful job here and left a marvelous legacy of craftsmanship excellent in detail and flawless in conception. If only for viewing these havelis a trip to Jaisalmer is more than amply rewarded. Jaisalmer is famous for its embroidery, Rajasthani mirror work, rugs, blankets and the finely cut antiques. The market in and outside the fort is famous for the bargain of local products. There is another famous marketplace for crystals and rare minerals outside the Jain temple. Flights are not the best way to reach Jaisalmer. Jodhpur is the nearest airport at a distance of 500 km. Indian Airlines has a twice-weekly service to Jodhpur from Delhi. From Jodhpur there is a direct train to Jaisalmer for overnight journey, except on Wednesday. The journey takes approximately ten hours. The Palace on Wheels is the most luxurious way to travel to Jaisalmer, recreating within the coaches the ambience of the legendary palace comforts. Advance reservation required. Jaisalmer is 897 kilometers from Delhi; 638 kilometers from Jaipur; 285 kilometers from Jodhpur; 500 kilometers from Ajmer, and 330 kilometers from Bikaner. Most of these places are connected to Jaisalmer by National Highway No 15.